In 1776, the British set forth to subdue the colonies. They began the effort by recapturing New York. First, they drove Washington off Long Island; then, from lower Harlem. After this initiative, Washington retreated to White Plains, where for the first time, he was able to hold off the British forces. The British, then again, outmanuevered Washington. Washington was forced to retreat to New Jersey. On July 3, 1776, British troops landed on Staten Island. Over a period of six weeks, British troop strength was increased so that it number over 32,000 by the end of August. Meanwhile, General Washington was preparing his men as well as he could under the circumstances. Washington was hampered by the British control of the sea, which allowed them to conceivably attack either Long Island or Manhattan. Washington decided to defend both vulnerable areas. On August 22, General Howe, the British commander, began transporting troops across the bay from Staten Island to Long Island. Washington decided to defend Brooklyn Heights by digging in around Brooklyn Village. Washington fortified the Heights of Guan, a range of hills 100 to 150 feet in height and covered by heavy brush and woods. The heights were broken by four passes. The furthest away was the Jamaica pass. Only five soldiers were detailed to defend the pass. On August 26th, Howe's troops quietly made their way to the Jamaica pass and seized the five American guards there. The British advanced behind American lines undetected until they reached the settlement of Bedford, where they opened fire. At that point, British troops rushed through the Bedford pass. Two hundred fifty American troops, under General Stirling, were surrounded on three sides. They fought bravely, but were soon overwhelmed. American troops were forced back into Brooklyn Heights. Cornwalis did not follow-up with an immediate attack on Brooklyn Heights. Washington's advisors recommended a withdrawal before British frigates could block the East River and any available means of escape. On the night of August 30th, Washington successfully withdrew his troops across the East River to Manhattan. Washington turned his attention to rebuilding his army. He was given instruction by the Continental Congress that allowed him to withdraw from New York. Washington began moving his supplies and wounded soldiers north from Manhattan. Meanwhile, Howe had decided not attack the heavily fortified Manhattan, but instead to outflank Washington and trap him. On September 13, Howe began to move his army across the East River to Kips Bay, there he hoped to cut Washington off. The landing was successful, and met only limited opposition. Washington's army, however, was able to successfully move North to Harlem Heights. The next day, a brief skirmish took place at Harlem Heights that became known as the Battle of Harlem. In this brief battle, several hundred British light infantry were badly mauled by Colonel Thomas Knowlton's Connecticut regiment. The Americans and the British began digging in. 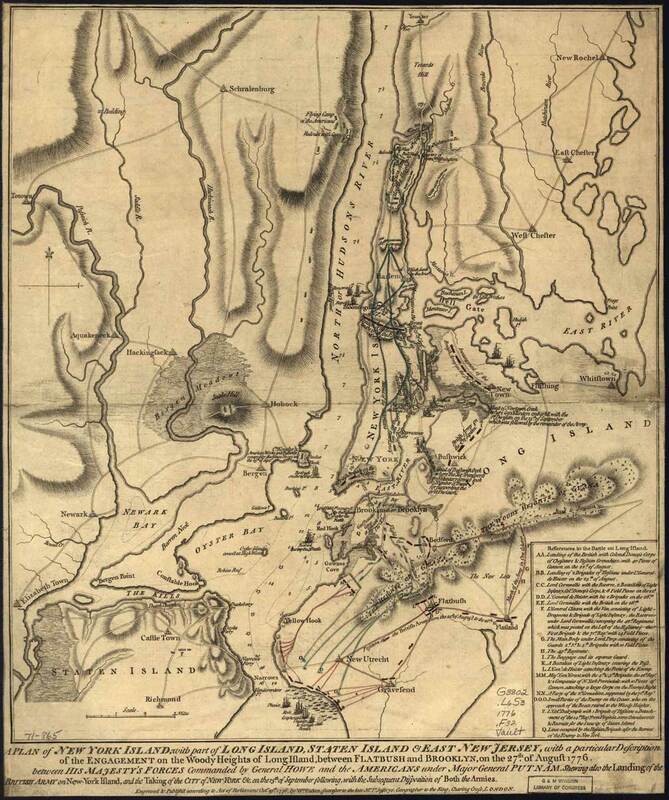 On October 12, Howe once again moved his army to the north to outflank Washington, this time at Throgs Neck. He landed there successfully, but his forces were bottled up on the Neck, which, depending on the tides, was sometimes an island. Washington decided to withdraw north to White Plains. The British slowly followed. It took Howe ten days to arrive in White Plains. There, on October 28th, the British troops captured Chattertons Hill, to the right of American lines. Washington soon withdrew to New Castle, and Howe did not follow.